Okay, so tonight I started a shawl with beads and I am using the guitar string method and I must say I think it’s brilliant. First I took a 6” piece of thin acoustic slinky guitar string that just so happened to be on my table next to me from Josh playing & adjusting his guitars the other night. Second I bent one end about an inch up, all the way over 180 degrees. Then I strung beads on the other still straight end. I was able to get about 90 8/0 beads on the wire. Finally I took an eraser from a pencil and slid it as a stopper on the straight end. I did bend that end but now I am thinking I should have left it straight for taking off the eraser & reloading beads. Once the beads are on, you knit to the stitch that needs the bead. Hook the stitch with the bent crook of guitar string & remove from needle, move a bead up on to the 2 pieces of string and off on to the stitch. It’s much easier to move the bead than pull with the guitar string. Put the stitch back on the left needle and knit the stitch. 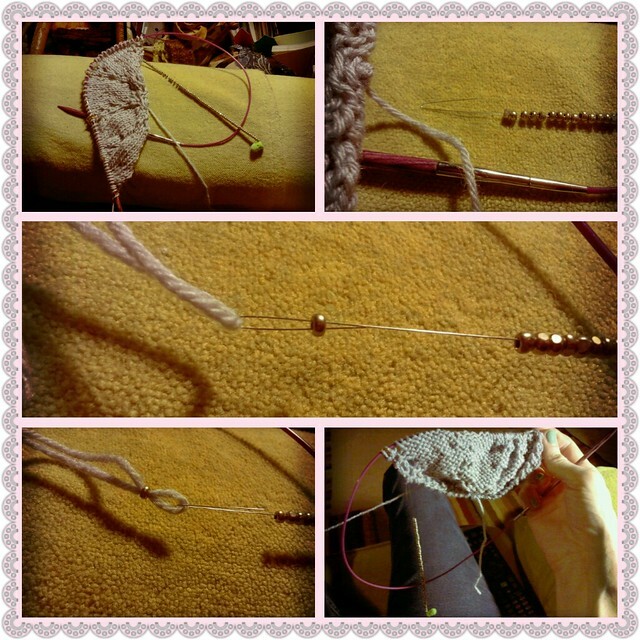 Using the bent end of the guitar string, hang from your knitting so it’s right at hand. Here is a photo collage to help. Progress above is on 3/28. Progress below is on 3/29. 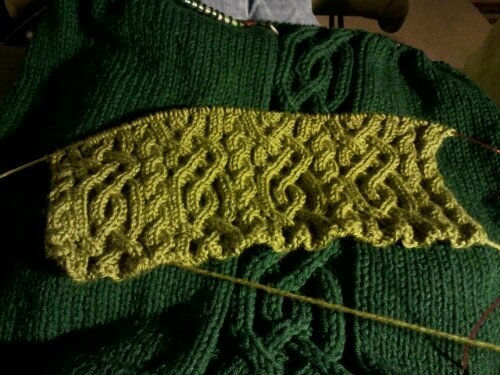 Up to 576 sts, 96 rows to go before another increase…whew! I love that there is ZERO brainwork on this project. 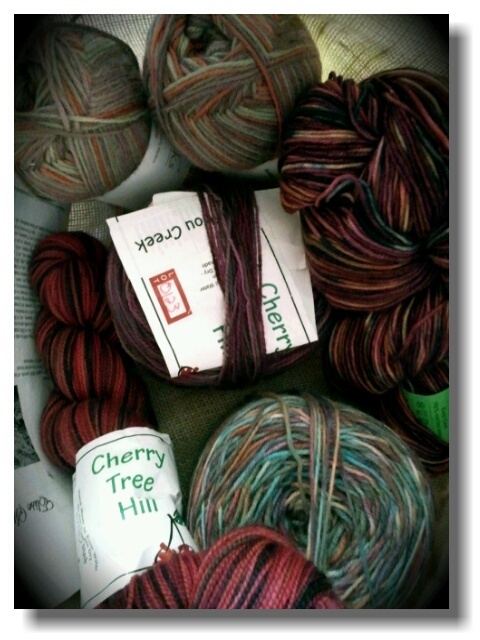 I am hoping once I go through my 3 skeins of Noro sock yarn it will measure close to 72″ across blocked. I am using 3 colors and alternating them every 3 rounds. Part of what makes this go so quickly is my impatience to see what the colors are going to do next. 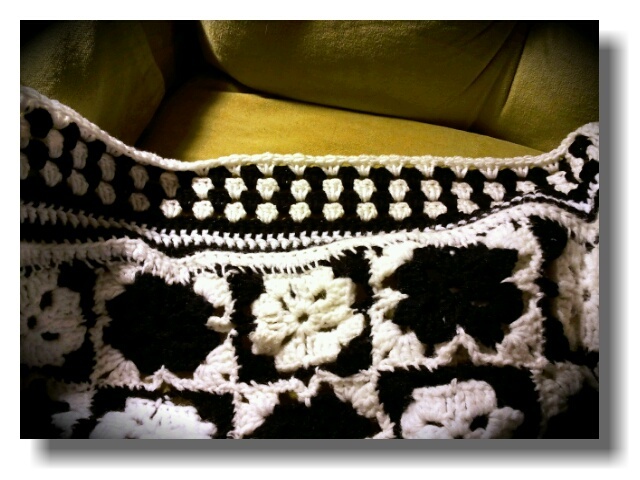 It will be a perfect spring & fall lightweight blanket for ME!! 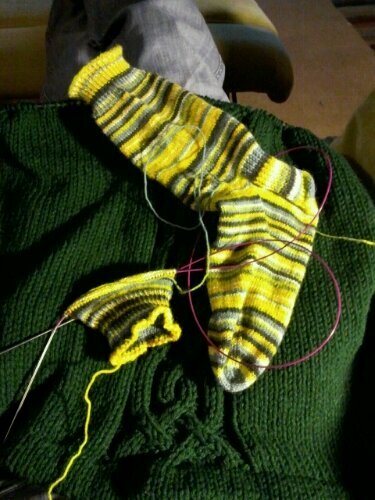 I have been working on 3 projects; one long term (more than 3 years hibernating), one gift for VDay, one pair of socks for me! 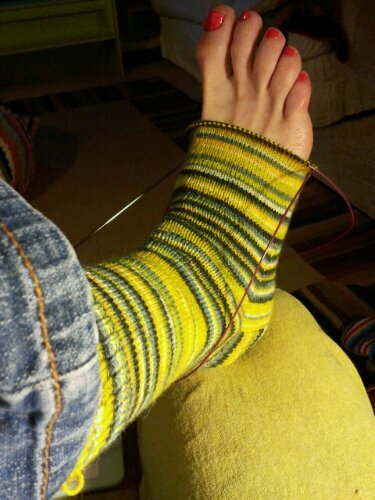 The socks are very basic 72 sts on size 0 needles, magic loop style, gauge of 11 sts per inch. Nice & tight to wear like iron.I have had this Trekking XXL yarn for many years and finally I broke down and decided that the perfect pattern is no pattern at all. This pic was last night when I was measuring when to start my toe decreases. Next pic is the finished first sock and the start of the second. This is the sweater I am making Josh for Valentine’s Day. 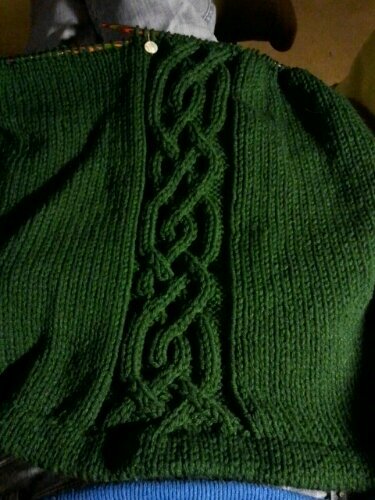 Basic info: in the round, bottom up, celtic knot cables worked up the front center and up both sleeves to saddle shoulder. 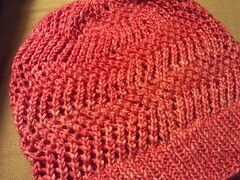 Heavy worsted weight yarn on size 10 needles. Picture above was taken yesterday, picture below was taken just a few minutes ago. 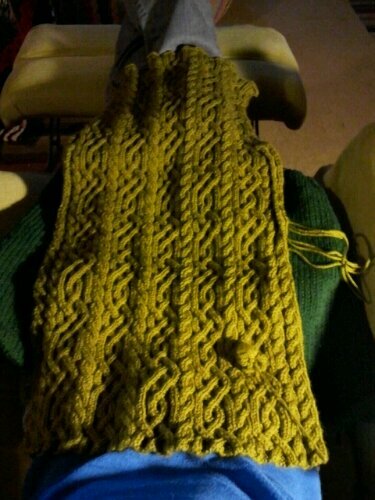 I must say I am getting a lot of knitting done now that I have a Kindle. I can read & read & knit & knit. Up close & personal with some knots. 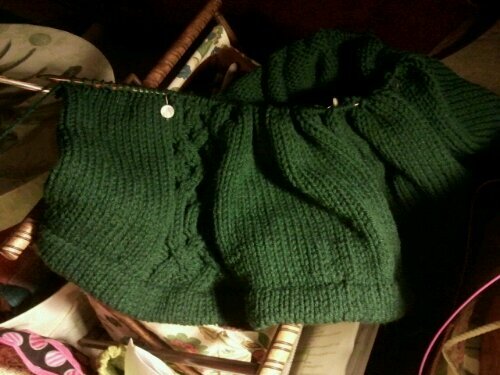 I finished up the back and got one of the fronts started. This is a pretty straight forward charted pattern but there is no multi-tasking with this one. 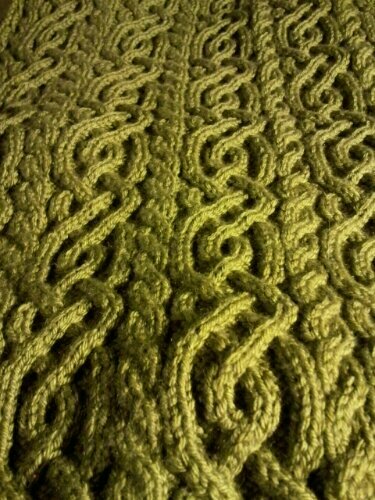 I love this yarn, RYC Cashsoft DK. I have another sweater, Julia, made from this yarn and it is one of the few I chose to take with me from California when we “temporarily” moved in 2010. I am so glad I did. It’s a gorgeous sweater as well and wears beautifully. I am enjoying my knits. 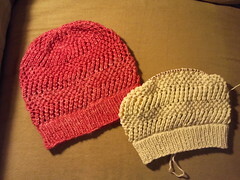 A couple fast & fulfilling, one difficult but a smooth knit, one a design of my own for the man I love. Right now I am feeling blessed to have time to work on these projects. For me, my choice. Not for hire, not for others. I love knitting gifts but I have to say sometimes I miss finishing and wearing my own knits. Oh! 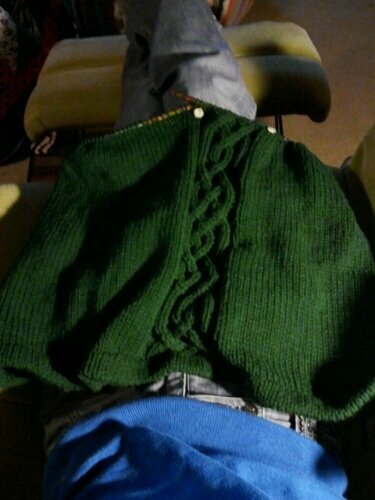 That reminds me…I need to get final pictures of my other recent finished sweater, the Delancey Cardigan. I have worn it multiple times & have had to wash it. White & yellow, no surprise that it will be needing washing after every few times of being worn. 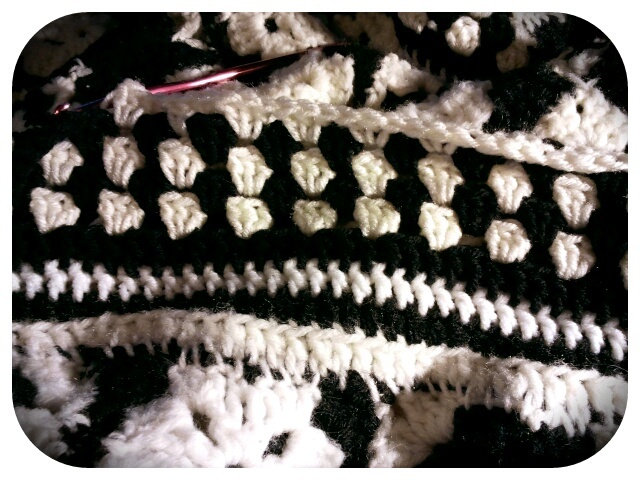 I am bordering the crochet granny square afghan we bought for Rex. It’s close to twin size but we need it queen sized for summer use on our bed. I have to finish the white round I am on, then I think one more round of black and finished! 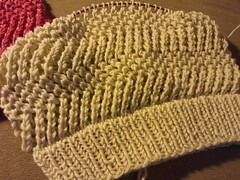 Semi-fitted & slouchy hats with a zig zag lace pattern… just in the beginning stage of designing a whole line using this open, airy, summery lace. group on Ravelry. This month it is a pick your own pattern from the Socks From the Toe Up book.